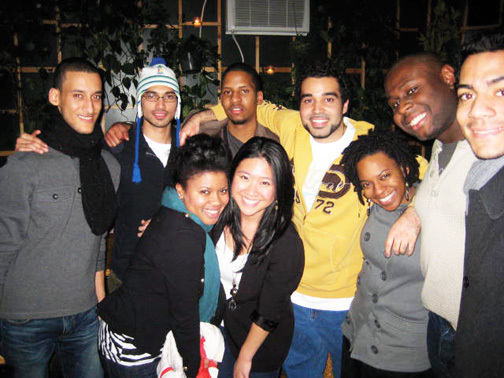 New York Variety Show: Back row: Luis Rodriguez ’09, Humzah Soofi ’10, John Boucard ’10, Omar Ramadan ’08, Kinei Braithwaite ’08, Twan Claiborne ’08, and Philippe Celestin ’10. Front row: Taleah Kennedy ’10 and NYC Connection co-chair Lily Ng ’08. Atlanta: At an Atlanta Connection “Swarthmore Cares” event on March 12, Swarthmore alumni gathered at MedShare International to help collect surplus medical supplies and equipment from hospitals, medical distribution companies, and individuals in order to redistribute them to qualified healthcare facilities in the developing world. Afterwards, the group headed to the Brickstore in Decatur for some food and drink. Los Angeles: Thirty alumni and friends attended the West Coast premiere of Borromean Rings by composer James Matheson ’92 at the Walt Disney Concert Hall. A reception with Matheson followed the concert—and the Swarthmore group was the last to leave the hall. New York: Many thanks to those who attended yet another successful Alumni Variety Show at the Nuyorican Poets Cafe. More than 100 alumni and friends attended the event. 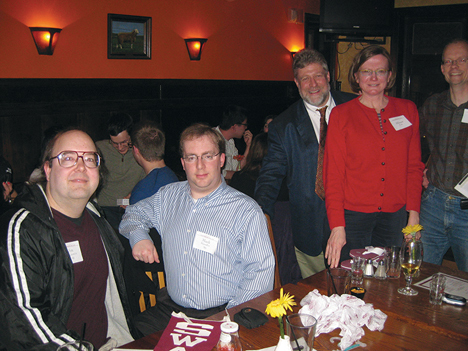 Rob Steelman ’92, who started the Swarthmore Business Network on LinkedIn, organized a get-together on March 2 at the Wheeltapper Pub in the Fitzpatrick Hotel. Fifty-two people attended, and many reported back to Rob that they had a terrific time networking and socializing. 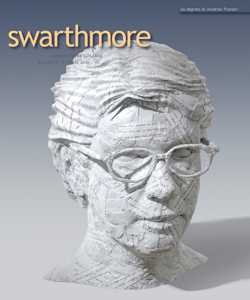 Philadelphia: Swarthmore versus Williams versus Amherst—but not in U.S. News & World Report! Billed by Philadelphia Connection Chair Jim Moskowitz ’88 as a chance to “defend the honor of your alma mater, put your storehouse of arcane and sometimes useful information to good use, and have a great evening,” a few dozen Swarthmore alumni answered the challenge and were successful. The game was Quizzo and the opponents were Philadelphia-area alumni from Williams and Amherst. It was a close match, but Swarthmore was ultimately victorious and everyone had a great time. Swarthmore Victorious: Philly Connection Chair Jim Moskowitz ’88 (left) led a Swarthmore team to victory over Williams and Amherst—at Quizzo. Jay Dahlke ’84 (far right) was joined by Allison Eck, a Bryn Mawrter who joined forces with the Swarthmore team. On March 28, Congressman Rush Holt (D–N.J.) presented a Swarthmore perspective on Capitol Hill. Holt, who taught physics at the College in the 1980s and researched fusion power at the Princeton Plasma Physics Laboratory in the 1990s, has been a member of the House of Representatives since 1998. Recently, he became the first human to beat the Watson computer in a Jeopardy match. Philadelphia: Chocolate Night Goes to Catalonia, when Chocolate Night returns for a fourth time on Thursday, May 5. As an educational as well as confectionery evening celebrating that dark delicacy, the scholar for the evening will be Professor of Spanish María Luisa Guardiola, who will talk about the important role that chocolate plays in the culture and rituals of her native Catalonia. Then, master chocolatier Chris Curtain will share insights into the process of making different types of chocolate from raw ingredients. As appetites peak, the evening will end with participants sampling from a potluck of chocolate desserts that each has brought (They need not be homemade, but they must contain chocolate!). Behind the scenes at the American Philosophical Society. One of Philadelphia’s little-known treasures, the American Philosophical Society was founded by Benjamin Franklin in 1743 with the aim to “improve the common stock of knowledge . . . for the benefit of mankind.” Its extensive collections focus on early American history and the history of science. On March 18, head of conservation Anne Downey and conservation intern Lisa Nelson ’06 will lead us on a behind-the-scenes tour of their conservation lab and show us some of the treasures held by the Society, including the journals of Lewis and Clark. The curator of the museum’s new exhibition Of Elephants and Roses: Encounters with French Natural History, 1790-1830 will then lead us on a tour of the exhibit. Pittsburgh: Connection chair Barbara Sieck Taylor ’75 gathered a group for a casual happy hour at the Walnut Grill on Jan. 16. Originally planned for Jan. 15, the event had to be rescheduled (happily) due to a Pittsburgh Steelers playoff game. Barbara reported that the event was fun and well-attended and that the Steelers won!